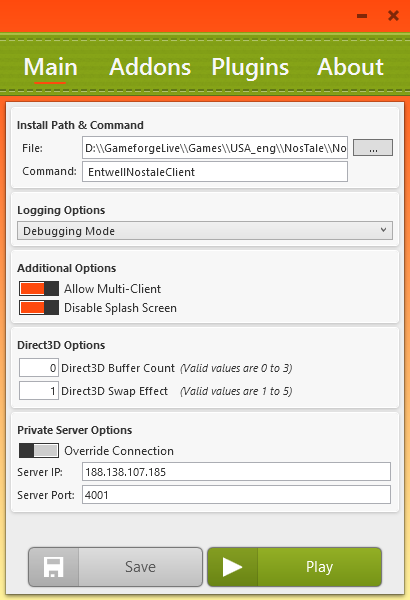 [CHG] Updated the default client file to work with the newest game client update. [CHG] Adjusted some internal variables for json parsing. 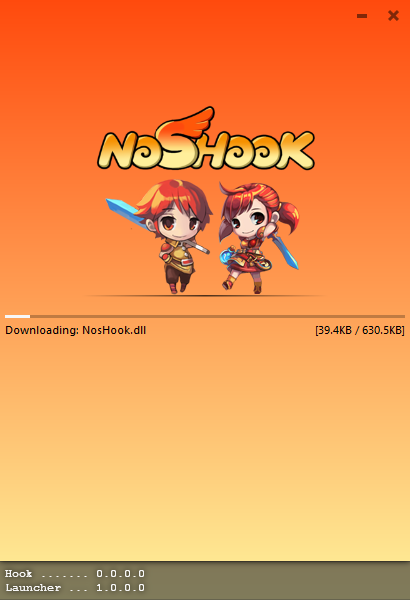 [FIX] Fixed some issues with downloads. [CHG] Changed the color of the save configuration button. [ADD] Added a popup to let the user know when the configuration has saved. [CHG] Adjusted when addons and plugins are checked internally. [CHG] Adjusted when an addon or plugin is marked as installed to prevent false-tagging things. Please DO NOT upload this file to other websites. Instead, link people to this post/thread or the thread holding the most current version. I do not like seeing my downloads on other sites as people tend to infect them and try to steal peoples accounts and such. I would rather people come to my site, the official location of NosHook and obtain a real copy here. Thanks for understanding! seems to always returns false. attempting to read anything but string does result in an error aswell. -- className must match the file name and main root node of the xml file. -- className must match the root node of the xml file. -- file is the full path to the xml config file. -- className is the name of the main config root of your loaded file. -- name is the name of the config setting you want the value of. -- defaultValue is the default value that will be returned if the function errors or the entry is not found. -- name is the name of the config setting you want to set the value of. -- name is the full file path of the settings to load. This function returns a table of the loaded json config. -- name is the full file path of the settings to save. -- t is the config table to save. These two things are completely separate. 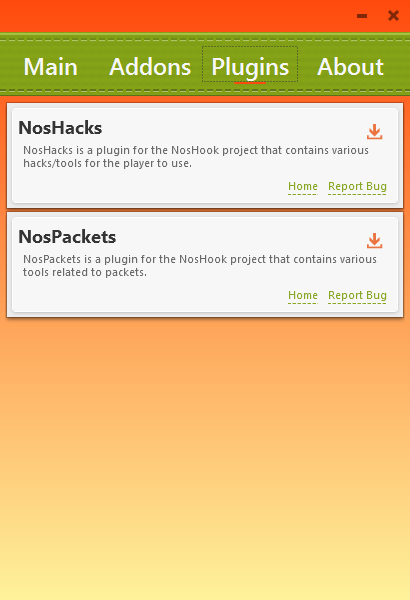 The config manager features are internal to NosHook. It uses XML based configuration files and stores information within the hook itself when loaded. The hook handles managing the settings while active. The settings.lua library is a JSON settings file handler. The settings:load function returns the loaded json config file into a Lua table. With this library you are responsible for the settings table the entire time. 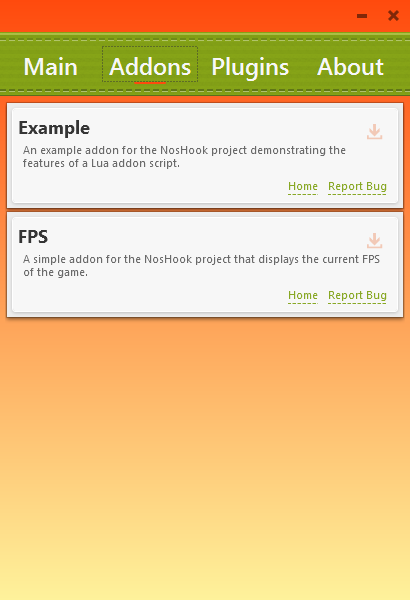 If you need an example of how to use the settings.lua Lua library, you can check out the FPS addon's source code. I tried the exposed functions listed in one of the docs, using the config used by the Noshook launcher (noshook.xml) for testing. However, since the listed functon config:load_config fails no matter what I input, trying to read any config variables will result in an instant closure of the game. config:load_config(name, file) - Loads a configuration file. - file - Optional parameter that specifies the file to load. config:remove_config(name) - Removes a config from the configuration manager by its name. - name - The name of the configuration to remove. config:save_config(name) - Saves a configuration file by its name. - name - The name of the configuration to save. - name - The name of the configuration. - key - The key to pull the value from. - key - The key to set the value of. I did resort to calling the ConfigurationManager (at least the loading part) directly which works fine. Was just wondering if I'm doing anything wrong or if there is smth wrong with the function. Instead of : for the config functions use . since they are not actual objects. It's just a table holding the functions so using : is passing an additional param that is not needed. Sorry about the confusion. 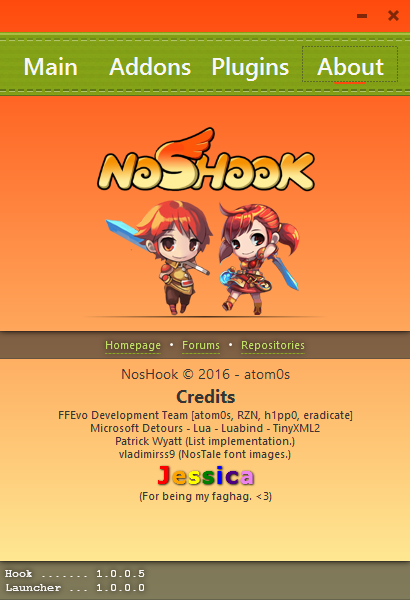 A lot of the docs in NosHook are copied from other projects of mine that use similar stuff. In some cases its setup differently in other projects which is why this got incorrectly documented when I copied it from another project. System.Exception: Failed to launch boot file.